Gardman 7651 Raised Wooden Cold Frame. 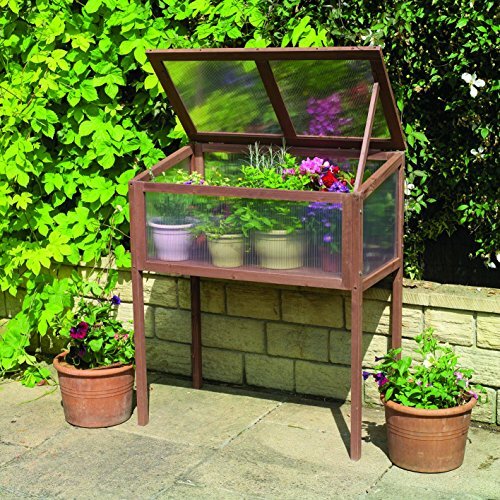 Attend to your plants without bending over with this attractive raised cold frame. Sturdy legs support this cold frame at a comfortable height to give your back a rest. Solid jointed frame constructed of FSC certified timber. Extend the growing season by insulating plants from frost. Perfect early spring protection while you “harden-off" young plants before placing in your garden. Hinged easy access door and body features tough, twin-walled polycarbonate to allow in sunlight and provide insulation. Simple, locking mechanism allows door to remain open for all-important ventilation. Dimensions: 20" Long x 36" Wide x 42" High. Gardman "Bring your garden to life"